Republicans are joyously shouting that while they lost the battle on healthcare, they’re sure to win the battle at the polls come November, as angry voters toss out Democrats. The old saw about counting chickens seems apt. For one thing, if they were really so confident they probably wouldn’t be shouting about it so loudly. That seems a bit unnecessary. But beyond that, November is a long time away, and though people may not like the healthcare bill right at this moment, most people have short memories. What should terrify Republicans is the prospect of an improving economy — however hopped up it is on artificial government stimulants — and steady month-over-month job creation stimulus. As for the actual correlation between a Republican takeover and healthcare, it’s just not that strong. 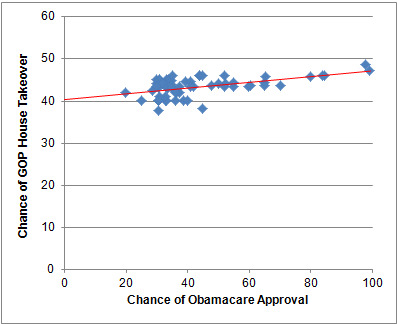 Nate Silver created this chart using the InTrade contracts for Obamacare passing and the Republicans taking over Congress. What is shows is that yes, there was a slight positive correlation between a GOP House Takeover and the Chance of Obamacare Approval, but it only moves from 40% odds of a takeover to 47% odds, which only means the healthcare vote only made a takeover 1/14th more likely.That’s at least according to market participants. Again though, we think the bigger problem is that November is a long time from now, and a lot will happen between now and then — and potentially a lot of it positive. A far better outcome for the GOP would have been for more than 210 Democrats to commit to the vote, but it still come up short.